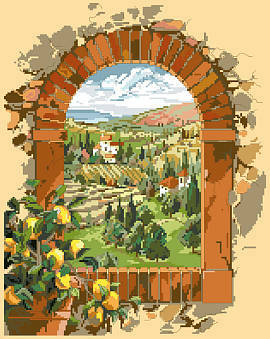 Tuscany, a charming land blessed by the genius of man and nature! A birds-eye view of vineyards on rolling hillsides with lush green cypress trees. This Counted Cross-stitch design by Nancy Rossi is sure to cause one to fantasize about living there, strolling down quiet lanes bound by creamy-colored villas, and basking happily in the Tuscan sun. Contents: Stitch Count 153w X 194h. Finished Size on 14-ct 11"X 13-3/4"